A Colorado State University electrical engineering graduate student has won the prestigious Theodore Maiman Student Paper Competition - beating a pool of 944 candidates - on the 50th anniversary of Maiman's invention of the laser. Brendan Reagan, 27, wrote a paper based on his work with Jorge Rocca, one of only a dozen University Distinguished Professors at Colorado State University, and several members of Rocca's group to develop a small, compact X-ray laser with a very short wavelength. Rocca is director of the multi-institutional National Science Foundation Extreme Ultraviolet Engineering Research Center, which is based in the Colorado State College of Engineering. Reagan works with fellow graduate students Federico Furch and Alden Curtis and research scientist Brad Luther in Rocca's lab. Reagan obtained his bachelor's degree in electrical engineering at Colorado State in 2004. "This is a huge honor for Brendan and for the university, particularly in a year celebrating the 50th anniversary of the creation of the laser - a revolutionary discovery that even President Barack Obama has recently recognized," Rocca said. "Lasers are a fundamental aspect of our everyday lives." Obama issued a statement on May 12 on the anniversary of Maiman's invention: "Only 50 years ago, lasers were labeled a ‘solution in search of a problem,' with no practical application envisioned outside basic scientific research. Today, lasers have revolutionized the way we live - from watching our favorite movies on DVD players to surfing the web to scanning barcodes at the grocery store. I commend the many American scientists and engineers whose ingenuity and contributions to laser science and technology have helped make the laser one of the most important and versatile inventions of the 20th century." 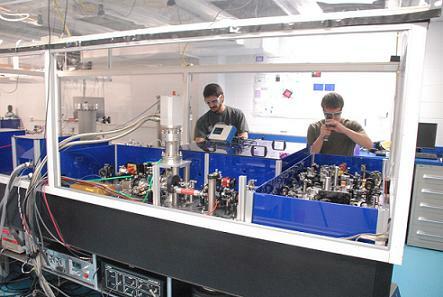 The technology developed in Rocca's laboratory involves the generation of short wavelength light in the extreme ultraviolet or soft X-ray range of the electromagnetic spectrum with wavelengths about 100 times shorter than visible light. These lasers can be used to "see" tiny features, create extremely small patterns and manipulate materials in ways that visible light can't. In the Maiman competition, Reagan was one of 21 semi-finalists selected from a record 944 student paper submissions. He won for his paper titled "Soft X-Ray Laser Pumped by a Joule-Class, All-Diode-Pumped Laser System" after he and two other finalists were judged on their innovation, research excellence and presentation ability. The competition comes with a $3,000 prize. "It's very nice that a lot of people from diverse areas in this important field recognize our research success," Reagan said. The NSF Extreme Ultraviolet Engineering Research Center is a partnership between Colorado State University in Fort Collins, the University of Colorado-Boulder and the University of California Berkeley that combines the expertise of researchers who are among the world leaders in developing compact extreme ultraviolet coherent light sources, optics and optical systems for nanoscience, nanotechnology and other applications.